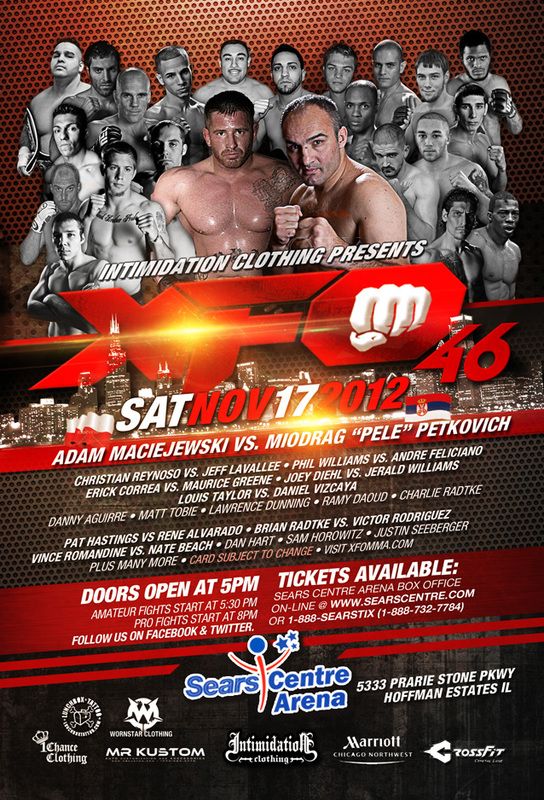 XFO 46 goes down tomorrow night at the Sears Centre in Hoffman Estates, and as usual the event will feature some of the best up and coming pro fighters in the area. It will also mark the return of Adam “Polish Pitbull” Maciejewski. Maciejewski is veteran of the local fight scene but has been inactive since 2009. He’s fought in Combat-Do, TFC, XFO and the IFL. He’ll get quite the “welcome back” from Serbia’s Miodrag Petkovich, who will be content to stand right in front of him and trade shots for three rounds. Petkovich is getting up in years, but he’s fought some well-known fighters like Aleksander Emelianenko, Igor Pokrajac, James Thompson, Travis Fulton and Tim Hague. He’s had mixed results since coming to fight in Chicago, going 1-2. He bested Mike Marrello at XFO 42, while suffering losses to Ed Carpenter and Jake O’Brien. In other fights, MTC’s Andre Feliciano will fight Team Curran’s Phil Williams. Feliciano beat Williams’ little brother to capture XFO’s amateur flyweight title at XFO 42. Now he’ll get big brother Phil as a pro. XFO promoter Dan Lardy is stoked about this matchup. “Watch for Feliciano/Williams, I expect that to be fight of the night!” Check out the video preview of the Feliciano vs. Williams fight here. Danny “The Assassin” Aguirre will look for his second straight win when he takes on Matt Wikoff. He was scheduled to fight C3, TFC and Ironheart Crown vet Wade Choate, but the switch was made today. Aguirre is not happy with the change. He tweeted: “Gotta love last minute opponent changes.. And weight class changes too. #unprofessional”. Three-time Chicago Golden Gloves champ and Team Curran fighter Erick Correa will make his pro debut against Lance Harvey. Correa told the Crystal Lake Patch that he ruptured the a bicep tendon in his right arm in February, then dealt with a deep-tissue infection in his leg in September.